I need to write a post! It's been such a loooooong time (actually, I just looked at my last post to check, and it's been eleven days, which isn't too terrible, so I took off one of the o's in looooooong). I don't have anything particular to write about, so I'll just talk about this past week. 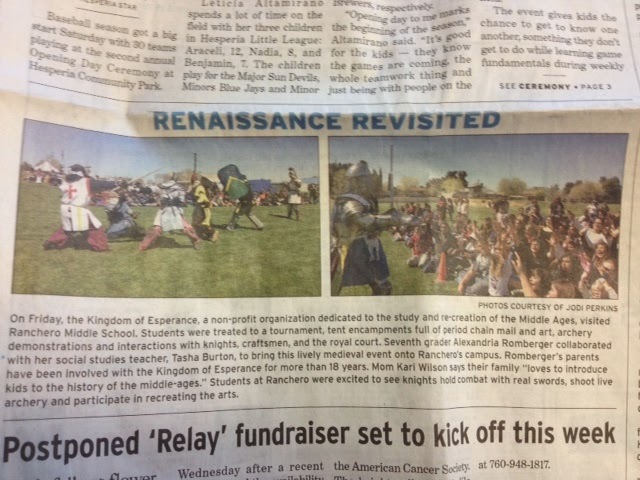 Let's see...on Friday, a production group called the Kingdom of Esperance visited our school and led seventh graders in a Medieval Festival, complete with tent encampments, archery demos, period-art, and a tournament of knights with real armor and swords. It was pretty awesome. Our city's newspaper was supposed to send a reporter to cover the event, but the reporter cancelled at the last minute, so I was asked to cover the event instead. It was so, so fun. I got to run around, interviewing the workers and taking pictures. Even during the archery demos, no one batted an eye when I trespassed over the caution tape to get close-ups. At one point, one of the more "official" looking people asked me if I was trying to get action shots. I honestly thought that he was going to tell me to step back. But instead, he escorted me closer and told the workers to wait until I was ready before shooting their next set. Sadly, those pictures ended up with a glare on them, so I was unable to send them to the press. For the record, I'm awful at taking pictures. I have no finesse for it at all. Kind of ironic that I ended up being the "reporter" for this event. Anyway, I sent my photos and story to the newspaper, and it came out on Tuesday morning. The only thing that grated on my nerves was the paper used my entire story, but labeled the byline "Photos courtesy of Jodi Perkins." Um...photos?? What about the article? I mean, it's small, but still. Grrrrr. I almost called them to complain, but then decided it wouldn't accomplish anything. On Saturday I was paid $400 to be a presenter for THIS. I have to say, I am ridiculously proud of my district for pulling off this little trailer. It's like your five year old running up to you with a drawing that actually looks half-decent. Anyway, I was asked to give a 45 minute presentation/workshop, and OH MY GOODNESS was it fun. After the presentation, I went skating with Shan and all the kids. My parents showed up to drop off a late birthday present for my nephew, and we all decided to go out to dinner. Usually we only get together for special occasions, so that was pretty awesome. A snake showed up in the girl's restroom on Wednesday. Tom, our maintenance guy, heard a girl scream in the bathroom, came running, and found the snake. He then brought the snake to me, because somehow I'm the unofficial animal care person on our campus. I let him know the snake was harmless and I would take him home with me and put him in our garden (great for keeping down the pest population when you're trying to grow stuff). But then my principal got wind of the snake and said there was no way I was allowed to keep him in my classroom (to her credit, she was very calm. I think I must give her a mini-heart-attack every week). Tom went to transport the snake to our outdoor lunch patio where I was going to pick him up at the end of the day. But when he arrived, the snake was GONE. We discovered a small gap beneath the handle of the carrier where the snake managed to escape. Of course this all happened AFTER my principal had told us "Don't you let that snake get loose on campus!" I really didn't feel particularly inspired to tell her that a snake was now roaming free somewhere between the cafeteria and room 405, so me and Tom kept it quiet that afternoon. The next day, Tom found our creepy little buddy in front of the snack bar. This time I didn't mess around. I picked him up (yes, with my bare hands. I ain't scared--or particularly bright) and put him in a giant glass vase and sealed a lid with air holes over the top. Our computer specialist asked if she could take the snake home because her daughter loves them, so I ended up handing him over to her, and the rest is history. This has turned into a long post considering I had nothing of consequence to write about. OMG Jodi, with your bare hands?? What species of snake was that? Reminds me of what I read yesterday about desensitization therapy and my lecturer used the snake example. Well, this is off the point but that's both scary and amazing!! Yeah Ify, with my bare hands, but only long enough to put him in the vase. I didn't walk around cuddling with him or anything. :) I originally thought he was a king snake (he had similar markings), but upon closer inspection, we saw that he was a gopher snake. They're harmless. I think in the desert, you can tell a venomous snake from a harmless gopher or garter snake pretty quick, because the 'safe' snakes have plainer colors, and they act differently. They're not all twitchy and on-guard--they're more relaxed and indifferent to your presence. I LOVE the commercial! It is so cute and fun. You must be so proud of your school. I think it was made by video production students at Sultana, which makes me SUPER impressed. I can't imagine being in high school and given the task to create a trailer for a "Common Core" conference. That's a pretty dry subject to work with! I actually thought about you Kristyn when I was writing about the snake, thinking how freaked out you'd be. ;) I can't believe you had a snake in YOUR HOUSE. Whoa. I've had a lot of run-ins with animals, but you've officially got me beat. I really considered calling the newspaper, but then I thought, what could they do about it? I mean, other than apologize? I guess they could write in their next paper "We hereby apologize to Jodi Perkins for not giving her credit for her article last week," but that would just be awkward for me. The thing is, what I really want is for my name to be on the original story (small as it is), and at this point there's no way to make that happen. I will say that everyone who knows about this situation agrees with you, saying that I should have given them hell over it. So you all are probably on to something.